Station Lane was once a through road linking the High Road with Pitsea railway station. 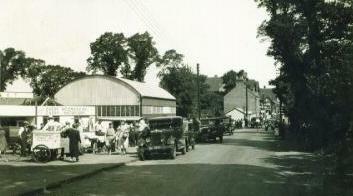 The first Pitsea market opened in 1925 and had an entrance in Station Lane. The war memorial once stood pride of place at the head of the junction from November 1928 until its removal in 1969 to Howard Park (now Howard Diamond Jubilee Park). In the late 1960s during the creation of the A132 South Mayne flyover and roundabout and future A13 Pitsea flyover, Station Lane was shortened to become a cul-de-sac. To accommodate the new road layout Pitsea market was moved in 1969 to what was Howard's field opposite Station Lane on the south side of the High Road. Many of the stalls on this site were within the steel structure of four large purpose built weatherproof domes. This second location lasted through the 1970s to January 1978 when the market was once again resited, this time to Northlands Pavement behind the The Railway public house and the Tudor Buildings/Broadway North shops. In 1978 a Tesco Superstore opened on a site adjacent to Station Lane. The council maintained public conveniences, opened in 1951 in a detached building, closed sometime in the 1980s. The building remained for years afterwards overgrown and almost hidden before it was finally demolished in the 1990s or early 2000s. Another building, dating from the early 1900s and used as a shop, was demolished around the early 2000s. This property had been empty for at least a year before its demolition; its last use being a fishing tackle shop.